Maths often seems to fill people with fear, but I am determined that my kids will not be scared of numbers. We have a great workbook from SA which we are working through but most of our Maths learning comes from real life living and doing some fun activities which I search the internet from. So I thought that I would share some links of our favourites (all printouts that I link to will be free printouts). Our bead/ button sensory bin. 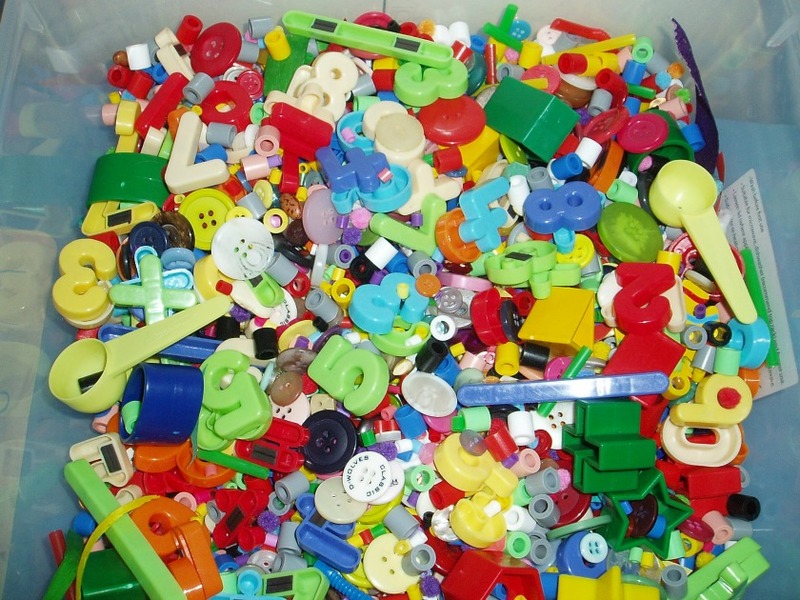 We have a plastic container which is filled with Hama beads and buttons. The kids love this container and often get it out themselves to sort the buttons/ beads or use the buttons and beads in their imaginary play. We also use this container with our letters and numbers. I have on a number of occasions hidden our magnetic numbers (bought from ELC in the UK) in the tub and the kids have hunted for them. 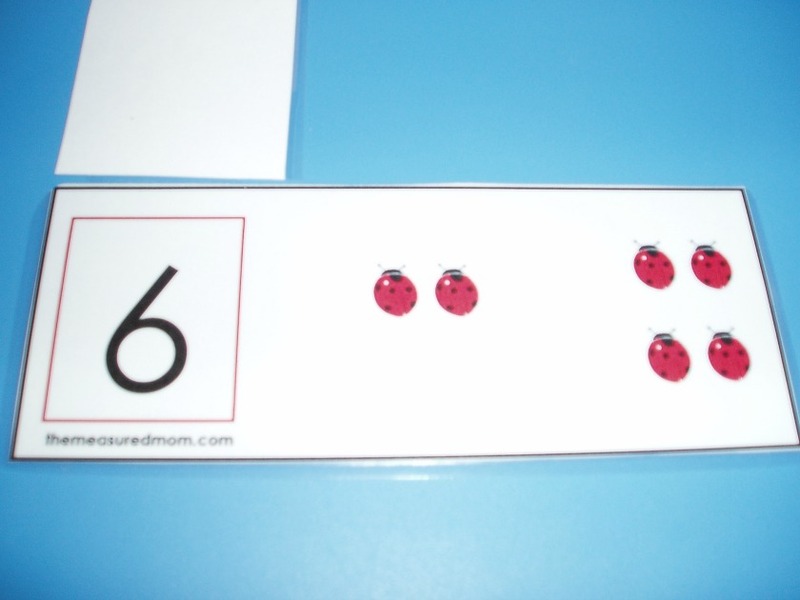 In the latest activity Blue hunted for the numbers to match them to numbers which I had written on a scrape piece of card and Pink hunted for the numbers as answers for some simple addition sums. 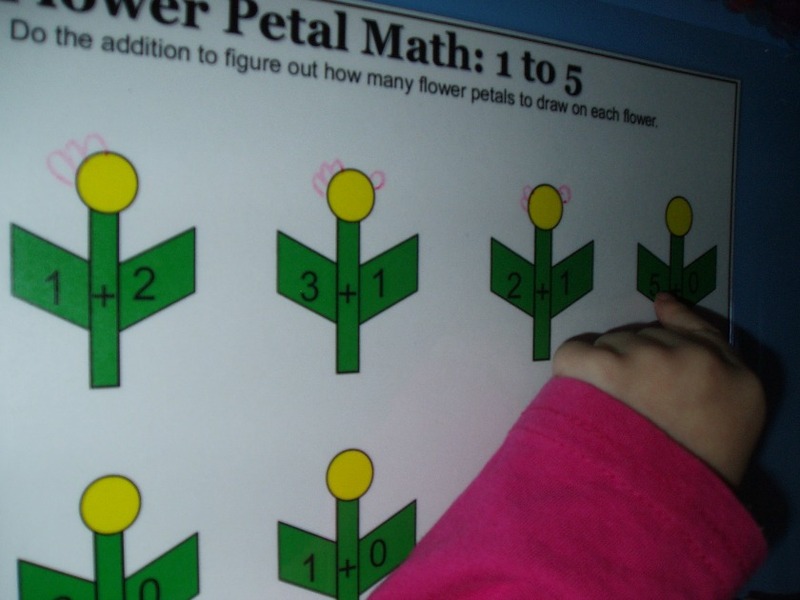 Both kids have also been loving these petal counting and petal addition pages from 3 Dinosaurs. I printed off the colour pages and laminated them so that Pink could do them more than once and so that Blue could scribble on them (and believe me she has done them over and over). 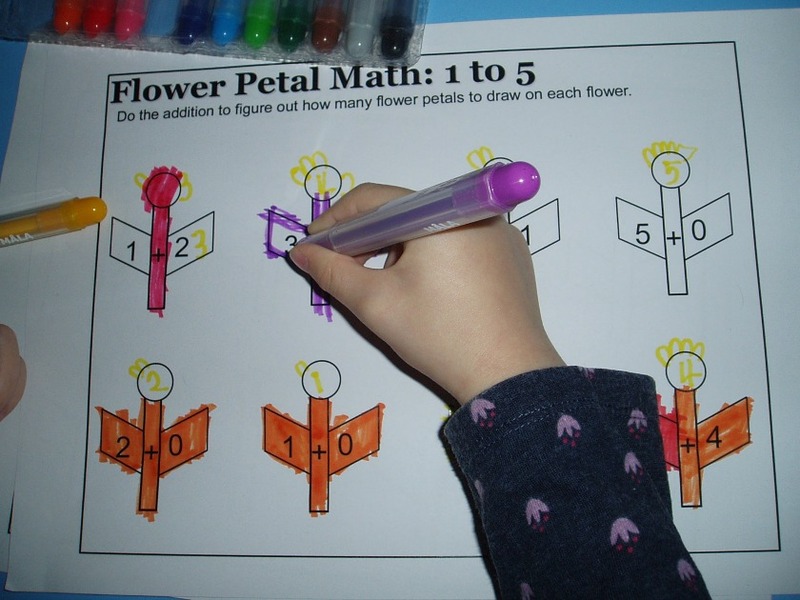 We also printed off the black and white pages and then Pink used different colour crayons to draw in the petals and colour the flowers in. Pink loves stickers, she is sticker mad. So she likes it when we use stickers as part of our “school work”. 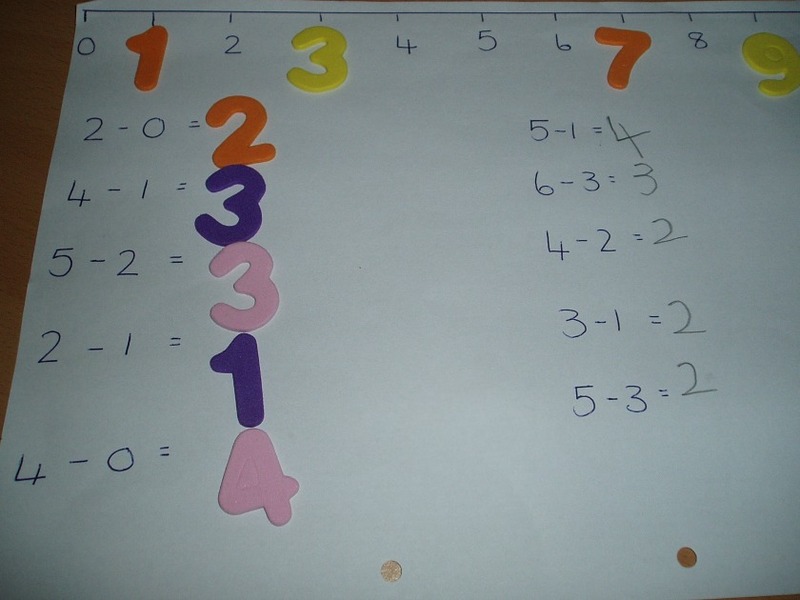 And it can be just a simple thing like building a number line, using stickers in her maths, filling in missing letters from words, it really does not matter how we use them, stickers are always a winner. We found these number stickers at our local Tesco’s for just over a quid (think we are now on our 4th pack). We also love these great addition cards from the measured mom. We printed ours onto card and laminated them which is just as well as they have been used a lot. Pink actually loved using these cards to pretend teach Blue, it is very cute to watch and I have been amased at how much Blue has actually picked up from these “teaching sessions”. 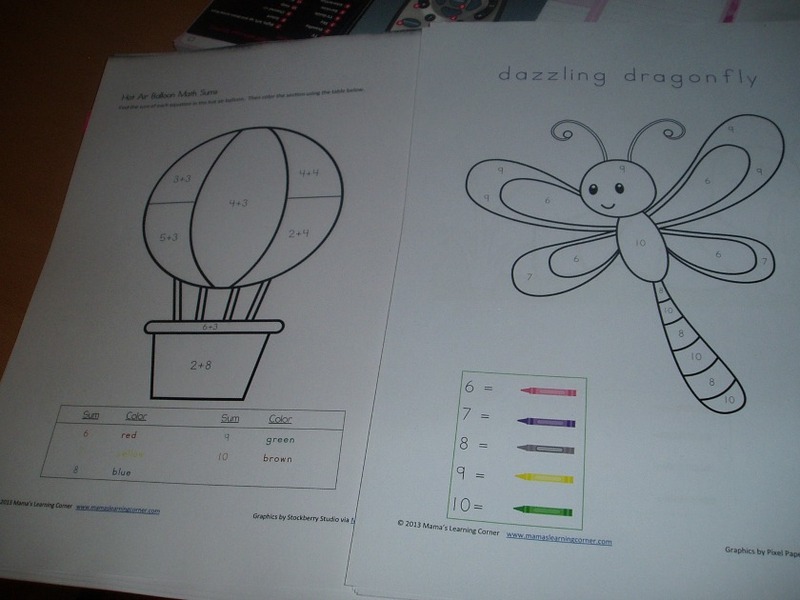 We have also used the colour by number and colour by sum pages from mamas learning corner. Just love these. Pink is not big on colouring in but she has loved the bug colour by number pages as has one of her little friends. Big winners in our house. We have not yet tried the colour by subtraction pages yet but we will give them a go at some stage. And don’t forget one of the best ways of teaching addition/ size and measurement is by baking with the kids. We love baking together. It is often messy and we have made a few flops but both my kids enjoy it and as a result of all the time helping me in the kitchen they are now trying new foods. So a winner all around. If you would like some child friendly baking ideas and have a look under the category Baking with Kids. Give it a go it is great fun for all. 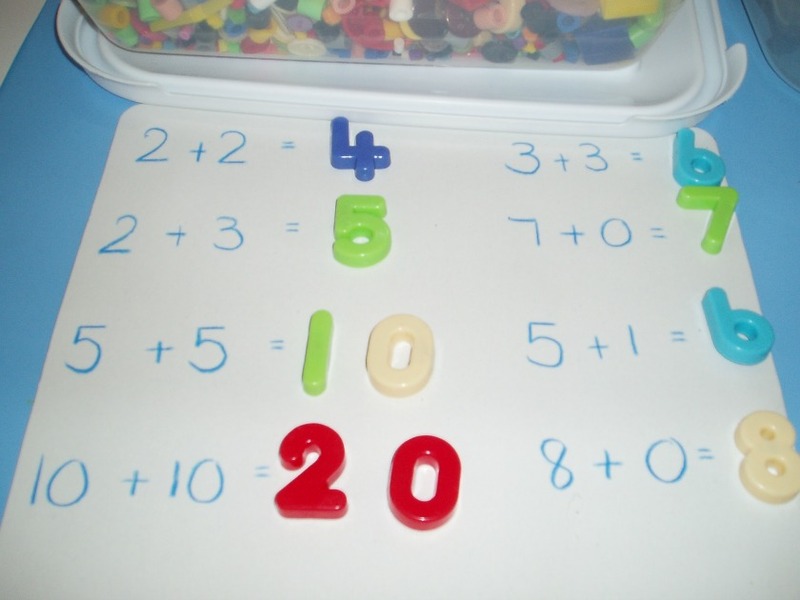 This entry was posted in free printable / worksheet, Homeschooling, ks1 maths and tagged home ed, homeschooling, ks1 maths, learning numbers, maths. Bookmark the permalink. I have a big family and we have a fair number of visitors so my children’s early maths has been marked by working out how many places to lay at the table. My children love cooking too. I found your blog via the Home Education weekly link-up. Hi. Thanks for popping over, I loved your idea about getting the kids to work out how many places to lay at the table, I have now started getting my daughter to add the knives and forks at dinner time – she thinks it is great – thanks for the fab idea !!! !